Ascending corporate ranks takes smarts, talent and guts. For Tiffany Kumar, a music-obsessed woman of color with big ambitions, the journey started with an internship for none other than Kanye West, then crafting College Dropout. As you can imagine, she learned a lot. The NYU graduate kept her foot on the gas from that point onward. Indeed, Kumar has long orbited the heart of the business—the song itself—from multiple angles. For starters, she appeared in MTV’s Making the Band. There’s the three-year stint writing songs for Universal Music Publishing. Add her history running creative for different companies and you’ve got a uniquely insightful perspective. Now, she’s playing a key role in one of the world’s most important tech platforms. As the Global Head of Songwriter Relations at Spotify, Kumar has leveraged her position to rightfully spotlight other talented women. Little victories (hiring female engineers for Secret Genius songwriting shops) and major wins (tapping Jhené Aiko to curate the sessions) both broadcast an important message from an industry estimated to be 93 percent male. 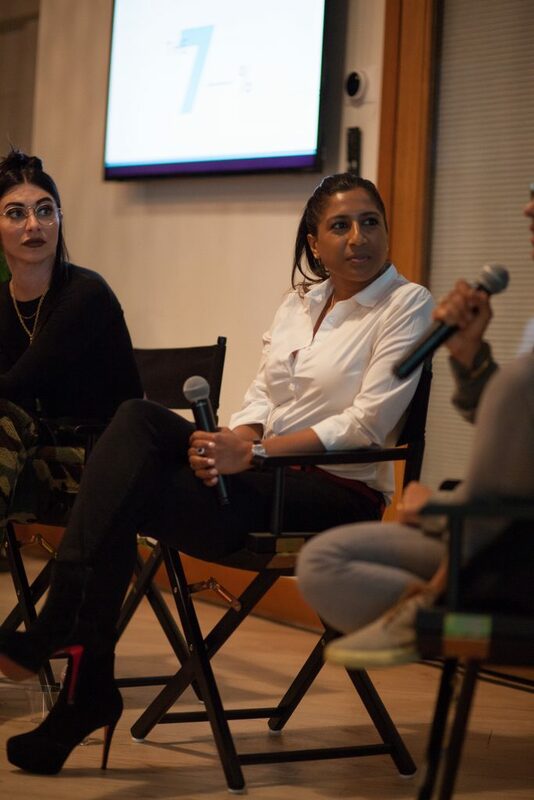 Last week, the exec stopped by Stem HQ to join the first-ever 7% panel, moderated and curated by rising producer TRAKGIRL. The two women, alongside artists Qveen Herby and Madame Gandhi, discussed the importance of striving for a more female future in music. Kumar shared additional thoughts with Stem after the event. Read our Q&A below and stay tuned for more 7% news. How did you first enter the entertainment industry. When did your desire to work within it take shape? While I was attending NYU, I applied for an internship with a producer named Kanye West. This was before he ever dropped an album. I was quickly hooked to the fast pace and creative energy that working in music brings. I’ve worn many hats in the music industry since then (songwriter, publisher, manager) but have always made sure to stay close to the song. What’s your mission, both professionally and ethically, and how does that mission relate to the 7% series? With Spotify, my mission is to build a bridge between the platform and the creators behind the hits we all know and love. It only serves the ecosystem to make sure we are fighting to increase the seven percent. For this reason, we maintain diversity in all of our initiatives. So professionally and ethically my mission is the same. How and where do you find empowerment as a woman in a male-dominated industry? Being aware and keeping my eyes open. It’s easy to glide through situations and accept how things are and more difficult to address where we need change. This awareness is empowerment. What do you hope to see from industry professionals, platforms and educational institutions to create a music ecosystem that better represents women? The imbalance exists at the infancy of a song and continues all the way to the charts and festivals and concerts with all-male lineups. Industry professionals should be combating all of this with fair representation at each step along the way. When it comes to songwriting, producing and engineering, we should be creating programs and education for young women to learn about these skills. What would you say to women hoping to make a career out of music? Your network is your net worth, so foster relationships. Work with other women. And at the end of the day, make sure you are owning your skills and talent to the best of your ability. How can men work harder to be considerate, helpful allies in turning seven percent to 50-plus? I think sometimes men don’t have sexism at the forefront of their minds. Many assume there isn’t a problem anymore. They can follow the same advice I would give women which is to be aware and to contribute to fair representation. It’s as simple as that really.